A custom designed sunroom may be the perfect addition to your home if you’re looking to boost its value. A sunroom adds usable square footage to your home as well as beauty and flexibility. When choosing a home remodeling project, you want to choose one that will make your home more livable and ultimately add to your home’s value. A sunroom addition does both beautifully. The cold temperatures combined with the shorter days of winter in Northern Ontario make it difficult to enjoy the great outdoors. 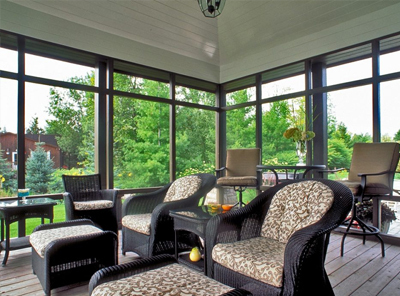 A sunroom, however, allows you to enjoy the beauty of nature from the comfort of your home. A sunroom is extremely energy efficient with large windows that allow the sun’s rays to warm the room. The high-quality glass used in the windows will keep the room comfortable year-round. So even in what feels like the darkest days of winter, you can enjoy the feel of the sunshine on your face. If you are thinking of adding a sunroom to your home, contact Windows Unlimited to get started. With a decades of experience, we are professional contractors who offer quality workmanship and first-class service to our clients and community. A custom designed sunroom may be the perfect addition to your home if you’re looking to boost its value.